This highly responsive instrument provides a powerful solo voice. Equally proficient in section work, it produces a full, rich sound that blends extremely well. Seven leading drum corps from DCI and one corps from Drum Corp Europe have chosen the King “Ultimate” Marching Brass from Conn-Selmer as their exclusive brass line. This large showing in the DCI ranks is the result of superior design that provides both a clear sound advantage, as well as physical control and maneuverability that allows for more successful movement. The USA-made King brass was first developed in conjunction with DCI perennial favorite, Phantom Regiment. Continual advances have been pursed since the line’s introduction and, today, King Ultimate Marching Brass boasts unique and patented features not available elsewhere. A unique aluminum "Ultimate" case is included with these instruments. In 2007, King Ultimate Marching Brass will be seen and heard at DCI events with Phantom Regiment, Blue Knights, Spirit of JSU, Blue Stars, Boston Crusaders, Sacramento Mandarins and Southwind. In Europe, Northern Star is the first to carry the amazing King sound in the Drum Corp Europe shows. The King line features six different instruments, specifically designed for marching field application. The King Marching Mellophones have always been a favorite for their sound and intonation. The addition of a dynamically angled mouthpipe helps deliver a fuller, richer tone on the model 1121. When I acquired a King 1121 Marching Mellophone I honestly expected to hate it. However, after having the instrument for a few days, I've grown to like it. The 1121 model reflects slight modifications that differentiate it from the 1120 and has been in production since 2003. A reconfiguration of the third valve slide, a somewhat dramatic angling of the lead pipe are two easily identifiable alterations that were inspired by drum corps clients utilizing the equipment. A side-by-side comparison of the King 1120 and the 1121 shows subtle differences in the profile of the instruments that utilize the same flare, bore size and valve cluster. Personally, the stock mouthpiece that ships with the 1121 (Mello 6) appears to be miscast with this instrument. The throat size seems too constrictive and neutralizes many of the instrument’s best qualities. For testing purposes, a Monette B2 Flumpet (STC-2 model) mouthpiece was substituted. The ergonomics of this instrument are somewhat challenging. This design makes already cramped quarters for the left hand a little more so. Also, to hold the instrument appropriately, the left hand is stretched to accommodate the third valve slide ring and the partially extended first valve saddle. The instrument, while light, is completely supported by the top knuckle of the left forefinger of the performer. The result is a third valve slide that is difficult to utilize in any effective manner “on the fly.” Due mostly to the placement of the third valve ring far away from the valve cluster. This is unfortunate considering this is the only production mellophone one can purchase with a ring on the third valve slide (a great option to have in my opinion). The reconfiguration of the King 1121 eliminated some much needed room for the left fingers. The overall length of the valve cluster and the distance between the thumb saddle and third valve slide ring is a stretch. The first valve slide incorporates a unique spring encircles the tubing. It holds the first valve slide in a neutral partially extended position and can be actuated to shorten or lengthen the slide with relative ease. The instrument has relatively good intonation and I only noticed the top line F being above pitch enough to warrant an extension of the third valve slide. The third line D is also under pitch and requires the first valve slide to be deployed about a quarter inch for the mouthpiece configuration used in the test. Depending on the mouthpiece strategy, extending the first valve slide a bit appears to put the horn in better intonation. The lower register on this instrument (below low C or concert F) is under pitched (a trait shared with nearly all bell front mellophones) and blows a little flat. Having a bit of first valve slide to shorten on the low B-flat, A, and G is a great benefit with this instrument. 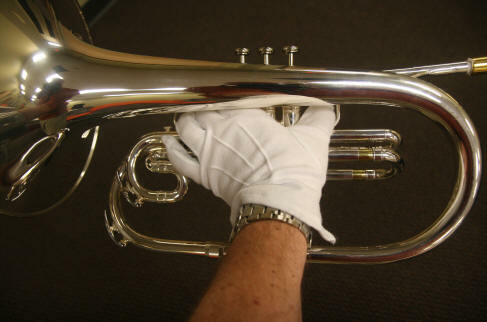 The 1121 is the only production mellophone encountered with a third valve slide ring. A big difference between the 1120 and the 1121 is the new geometry associated with this third valve slide. Sadly, the third valve ring is placed too far from the valve cluster. The angled lead pipe seemed a bit dramatic on first inspection, but it didn’t hamper acclimation and could possibly be a great benefit to down stream embouchure wearers such as horn performers who double on mellophone. The pistons move quickly and smoothly on the 1121. The valve taps are concave and while I didn’t quite like them at first, I grew to appreciate them after rehearsing with the instrument for a few hours. These taps seem to work particularly well with the cotton gloves. 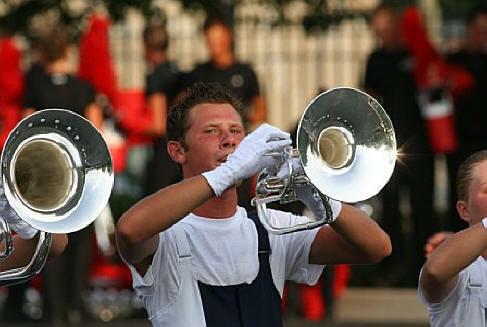 The Blue Stars' Greg Stoecker at a warmup in Indianapolis in July 2007. The Blue Stars are one of the World Class drum corps exclusively utilizing the King line of marching brasswinds. The instrument is capable of generating a pleasing mellophone tone, but it has a strong tendency to sound bright, particularly at elevated volume levels. There is also some volatility with this instrument. Slots aren't as well-defined and there is a need for the player to have a very strong pitch reference. This instrument rewards strong technical prowess and a disciplined performance approach. 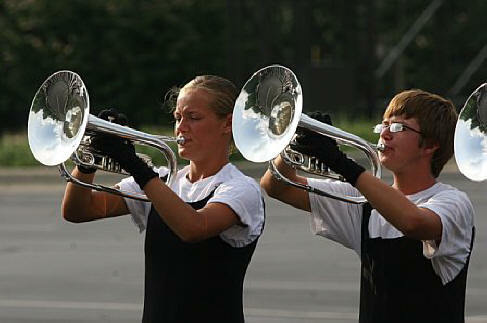 Caitlin Bailey (L) and Erik Preslar (R) of the Southwind Drum and Bugle Corps at pictured at a warm-up in Indianapolis in July 2007. Note the angled lead pipe and the impact it has on the bell angling while the horn is in playing position. Partials on this instrument seem pretty narrow throughout its tessitura. I wonder if this is a result of the configuration of the lead pipe. The top line F (concert B-flat) is open and a lot of the technical pyrotechnics that are part of the modern mellophone music (particularly in the drum corps environment) can be facilitated effectively on this instrument. This instrument doesn’t have a lot of advantages over the Yamaha 204M, but its facility around the top line F is certainly an important advantage. The 1121 appears to be fabricated well with a well-applied finish and well-executed details. Oddly, the lead pipe is spot soldered to the flare tubing exiting the third piston. No bracing is used, just a spot solder. Overall, this is a solid instrument with only minor, but manageable flaws. The best results with this instrument are supported with a proper mouthpiece selection. Users are urged to experiment and find the appropriate mouthpiece to fit their ensemble and playing level. This instrument is available at the Woodwind and the Brasswind.